The community of national security scholars benefits whenever Richard K. Betts publishes a new article or book, because his work is consistently well researched, gracefully written, thoughtful, and provocative. I find this work to be no exception and said so on the jacket cover when the book was published. The distinguished reviewers gathered here agree that Betts has produced another worthy volume, although some are disappointed at what they see as an overly shrill tone in some chapters. One of the most remarkable aspects of this book is that Betts emerges as an avowed dove—sort of—after a long history of sounding rather hawkish (although never extreme). Betts in fact refers to himself in the preface as a Cold War hawk, now converted into a post-Cold War dove—even if, he tells us, this “recent dovishness is of a crusty sort” (xi). Richard K. Betts. 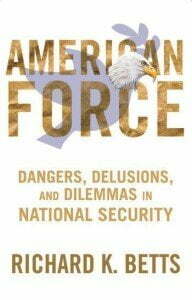 American Force: Dangers, Delusions, and Dilemmas in National Security. New York: Columbia University Press, 2012. ISBN: 978-0-231-15122-1 (cloth, $29.50/£20.50). The Cold War, he maintains, was a time when communism—backed by a fearsome military establishment in the Soviet Union—posed a threat to freedom around the globe and had to be forcefully opposed. In contrast, he argues, today’s threats (with Al Qaeda and Taliban zealots at the top) are far less daunting; therefore, the role of U.S. military force can be ramped down. He recommends caution and restraint in the conduct of America’s international relations, although certainly not a return to isolation. When it becomes necessary to take up arms, he advocates a decisive use of force, a position advanced by General Colin L. Powell when he served as Chairman of the Joint Chiefs of Staff during the first Bush Administration. Betts is especially wary of the faint-hearted applications of U.S. military force that never really achieves America’s foreign policy objectives, as occurred during the Clinton Administration’s limited involvement in the Balkans. Yet he is equally concerned about the rash application of military force, as with America’s “reckless adventurism” in Iraq (xii). Were Betts in charge, the government would be more resolute at the right times and less driven by madness in between. “Massive force or none at all”—that is his prescription (298). Put so bluntly, it sounds like a return to the 1950s and Eisenhower’s doctrine of massive retaliation, only one that is dependent on large-scale U.S. troop invasions abroad rather than the use of nuclear weapons. Yet the Kennedy and subsequent Administrations viewed this “either/or” stance as too rigid; they preferred a wider range of options—a capacity for flexible response. Powell, too, has been criticized for his advocacy of massive force, which runs counter to the just war notion of proportionality. Moreover, it can become difficult to extract a large force once it is deployed overseas; and the presence of such force can provoke other major powers to become involved in the conflict, as well as deeply alienate nations in the region who fear a lasting U.S. hegemonic presence. Much of this work is about armed intervention: when the United States should use its muscle to shape world affairs. No subject of American foreign policy is more important than this one and Betts performs an important service by making this topic the center of his book (which has four original chapters). He is sensitive as well to the flip side of the question: once the United States is involved abroad with military force, what is the best exit strategy? This was another concern of Colin Powell’s. Betts also provides a useful primer on weapons of mass destruction, and along the way he effectively refutes the claim of some Pollyannas that such instruments are unlikely to be used against the United States. “Aversion to focusing on WMD is deeply wrong,” he states (108), especially when it comes to nuclear and biological threats to the United States (as opposed to chemical ones, which have a more limited destruction range and are less likely to affect large populations). Betts also draws attention to a rising China and a Russia in resurgence—the two other giants on the planet with whom America must contend, and both of whom are armed with a sufficient number of nuclear weapons to level every city in the United States. The biggest danger in his view is the possible uniting of China and Russia against America. While this was once an unlikely scenario, Washington, D.C.’s persistent criticism of both regimes could lead them to a sense of common purpose against the United States. These opening remarks just skim across the surface of many significant and interesting issues that Betts raises about the use of American force. This book is an intellectual banquet, so pull up a chair; the reviews presented here, written by Eliot A. Cohen , Peter Feaver, Robet J. Lieber, and Scott Silverstone, are sure to whet your appetite. Although he joins the other reviewers in praising Betts’s well-deserved reputation for clear writing and good sense, Professor Eliot A. Cohen believes that in this particular work an angry tone detracts from an objective critique of U.S. military interventionism. “Contempt makes for questionable analysis,” he writes, accusing Betts of engaging in “cheap shots” against some intellectuals and policymakers with whom he disagrees. Cohen laments what he sees as a central error in the work: the attempt to weave together analysis and polemics, dispassionate critique and policy prescription, without providing appropriate distance between these approaches. This serious disappointment aside, Cohen nonetheless praises much of the book, highlighting Chapter 10 in particularly (entitled “Plans and Results: Is Strategy an Illusion?”) as a “brilliant” illustration of Betts at his best—a judgment shared by other reviewers. Professor Peter Feaver views the book as a “strong contribution to the field;” but he, too, points with some misgivings to Betts’s efforts at attempting a balanced analysis while lacing the work with an angry attack against those who have misused American military force. He finds Betts persuasive in much of the analysis, but quite unpersuasive in the more polemical sections of the book. “Betts comes close to making the scurrilous charge,” Feaver writes, “that the U.S. approach to military force was the clichéd three-year-old with a hammer.” In reality, Feaver argues, “policymakers were justified in seeing many hangnails that could wound the United States and considering using a hammer to neutralize them.” Feaver reminds us, as well, that the book looks at only the actual uses of force by the United States, without due consideration of the many times when Washington officials turned away from the military instrument and pursued diplomatic, economic, covert, and other approaches instead. While joining the other reviewers in questioning Betts’s “sometimes acerbic style,” Professor Robert J. Lieber nevertheless recommends the book as a means for having one’s “preconceptions challenged by an original and rigorous thinker.” As an example of Betts’s skillful puncturing of common assumptions held by the foreign policy establishment, Lieber cites one of the best lines in the book: the crusading view eschewed by Betts that “deep inside every foreigner of good will must be an American struggling to get out” (9). Embracing Betts’s moderate stance that U.S. military intervention should be more selective, Lieber still wonders whether Betts has become too selective. He cites, for instance, Betts’s conclusion that “there was no logical necessity for the U.S. to weigh in on the Balkans in the 1990s . . . “ (295). At the time, the mass rapes and other severe violations of law and morality in the region seemed impossible simply to ignore. Lieber, too, questions Betts’s embrace of the Powell-like doctrine of “massive force or none at all.” He points out that the options for policy planners in Washington are, and should be, “far more wide-ranging than all-or-nothing.” Moreover, he doubts the wisdom of distancing the United States from the Middle East and Southwest Asia, as Betts advocates. Lieber views a head-in-the-sand approach as unlikely to improve America’s understanding of and success in these parts of the world. Professor Scott Silverstone agrees with Betts’s own judgment at the beginning of the book that the tone is “grumpy and negative,” but he applauds the overall thesis that U.S. leaders have tended to rely excessively on military force to achieve ambitious policy goals. He points to the 2003 U.S. invasion of Iraq as a telling example of how “rosy expectations” in the beginning soon met the hard reality of trying to establish a legitimate, representative government with pro-American leanings in a region unpracticed in democratic procedures and hostile toward the U.S. alliance with Israel. Silverstone emphasizes that no clear formula exists for determining when the United States should or should not intervene with troops overseas, but he commends Betts for taking the position that policymakers in Washington should establish modest goals from the outset. Along with the other reviewers, he commends Betts for offering a broad discussion of strategic complexity that can serve as a basis for deeper thinking about under what circumstances the United States should intervene with force overseas in the future. Richard K. Betts is Arnold A. Saltzman Professor and Director of the Saltzman Institute of War and Peace Studies at Columbia University, and Adjunct Senior Fellow at the Council on Foreign Relations. He received his degrees at Harvard University, served on the staff of the Brookings Institution, and taught at Harvard and Johns Hopkins. His books include Soldiers, Statesmen, and Cold War Crises, 2d edition (Columbia University Press, 1991), Enemies of Intelligence (Columbia University Press, 2007), and five published by Brookings: Surprise Attack (1982), Nuclear Blackmail and Nuclear Balance (1987), Military Readiness (1995), The Irony of Vietnam (coauthor, 1979), and Cruise Missiles (editor, 1981). Loch K. Johnson is the Regents Professor of International Affairs in the School of Public and International Affairs at the University of Georgia. He served as assistant to the chairman on the Church Committee, staff director of the Subcommittee on Intelligence on the House Intelligence Committee, and assistant to the chairman of the Aspin Commission on Intelligence. His latest books are The Threat of the Horizon: An Inside Account of America’s Search for Security After the Cold War (Oxford, 2011), and National Security Intelligence: Secret Operations in Defense of the Democracies (Polity, 2012). He is the senior editor of the international journal Intelligence and National Security, published in London. In 2012, he was selected as the inaugural winner of the Southeast Conference Professor of the Year Award. Eliot A. Cohen is Robert E. Osgood Professor of Strategic Studies at Johns Hopkins University’s School of Advanced International Studies (SAIS). He has written on a variety of subjects including civil-military relations (Supreme Command: Soldiers, Statesmen, and Leadership in Wartime) and air power. His most recent book, Conquered into Liberty: Two Centuries of Battles Along the Great Warpath that Made the American Way of War is a study in military history. Peter D. Feaver (Ph.D, Harvard 1990) is Professor of Political Science and Public Policy at Duke University. He also directs the Triangle Institute for Security Studies and Duke’s Program on American Grand Strategy. He has authored, co-authored, and co-edited several books on civil-military relations, public opinion and the use of force, and nuclear command and control. He is currently working on several research projects related to American grand strategy, as well as others on civil-military relations and the use of force. His most recent book, co-authored with Sue Wasiolek and Anne Crossman, is Getting the Best Out of College (Random House, 2012, 2nd edition). Robert J. Lieber (Ph.D. Harvard, BA Wisconsin) is Professor of Government and International Affairs at Georgetown University. He is author or editor of sixteen books on international relations and U.S. foreign policy. His latest book is Power and Willpower in the American Future: Why The United States Is Not Destined To Decline (Cambridge University Press, 2012). Other recent works include The American Era: Power and Strategy for the 21st Century (Cambridge University Press, 2007), and an edited volume, Foreign Policy (Ashgate Library of Essays in International Relations, 2008). His articles have appeared in scholarly and policy journals including International Security, Foreign Policy, World Affairs, The National Interest, American Political Science Review, British Journal of Political Science, The Chronicle of Higher Education, The International Journal of Politics, Culture and Society, Commentary, Internationale Politik (Berlin), Politique Etrangere (Paris), and International Politics (London). Scott A. Silverstone is Professor of International Relations at the United States Military Academy at West Point. He is the author of Divided Union: the Politics of War in the Early American Republic (Cornell, 2004) and Preventive War and American Democracy(Routledge, 2007). He is currently at work on a book about the preventive war dilemma and the 1936 Rhineland crisis. This book is an uneasy mix. It consists of chapters published previously as articles, with interstitial material written for this volume; it deals with generic topics such as the nature of strategy and of civil-military relations, but then shifts the focus to American defense and security policy. Most problematically of all, it attempts to blend traditional scholarly analysis of enduring issues with policy prescriptions for the here and now. At his best, even where one may disagree with his conclusions, Betts is lucid, analytic, forceful, and conceptual in his analysis of strategic problems. His discussion of the management of relationships with a rising China and an unsettled Russia, for example, (Chapter 8, “The Main Events: China’s Rise and Russia’s Resurgence, 171-200) are useful summaries of why American relationships with both countries are likely to be troubled, and why they may spin out of control. His discussion of how strategic concepts like deterrence have survived the Cold War but may be inappropriately applied in the twenty-first century context is illuminating (see 98ff.). Despite these and other high points, however, American Force is crippled by its author’s asperity. Betts seems to recognize this when he writes in his preface of his hope that the language “does not sound arrogant,” and concedes that it may seem “grumpy and negative.” Indeed he starts with what he terms “an apology” for which his excuse is “impatience” (xii). The truth is that Betts is not merely grumpy, but angry – angry at the needless loss of life in recent wars, angry at the folly of those politicians with whom he disagrees, and angry at policies he thinks short-sighted, vain, arrogant, or foolish. The result is a book too often marred with cheap shots – “arm chair field marshals” – for example, or “hawks who think of themselves as stalwart, steely-eyed and far-seeing” (274, 140). It resorts to easy characterizations of intellectuals and policymakers — “prominent neoconservatives, liberal hawks, and fervent multilateralists” (17). And sometimes it simply sneers at the expense of historical accuracy: “The Clinton strategy was in effect ‘multilaterally if we can, unilaterally if we must,’ while Bush II’s was the reverse” (40). An innocent reader could be excused for thinking that the President who launched a war (Bosnia) without a UN Security Council resolution was Bush, and that the President who launched a war with a UN Security Council resolution (Iraq II) was Clinton, rather than the other way around. Contempt makes for questionable analysis. So too does a lack of empathy for the predicament real policymakers find themselves in, and indeed Betts himself pleads guilty to criticisms that “reek of the naïve simplification that often goes with academic detachment” (xii). But the problem is not merely “detachment.” The truth is that very few questions of policy, including the use of force, reach the desk of the President of the United States that are not complex, ambiguous, and fraught with difficulty that the inhabitants of the Oval Office understand very well. Betts often gives categorical injunctions to policymakers e.g. “withdraw U.S. forces” and “honor moral obligations” that are all very well, but probably contradict one another (67-68). Bromides like “avoid half measures” (62) are fine, but does that mean that the solution in, say, the Libyan uprising of 2011 was carpet bombing? Betts’ self-confessed lack of experience in high office is irrelevant: what matters is a failure to imagine what it is like to be making the decisions that he dissects, which is well within the scope of any scholar. Betts is a historically informed scholar, but he can be prejudicially selective in the cases he uses to make his point. For example, in reaching the questionable conclusion that preemptive attacks on nuclear facilities do no good, he argues that the Israeli raid on the Iraqi Osirak reactor in 1983 had no serious impact on the Iraqi program (137). He concedes that he will not discuss the 2007 Israeli attack on the al-Kibar reactor in Syria, which of course does not fit his argument quite so comfortably. There is, in addition, a broader historical problem. For Betts, as for too many students of American strategy, history begins in 1945. The consensus that national defense meant “missions far from home” only “took root after 1945” (284). But even in the colonial period, Americans were at the mercy of European conflicts, and went to wage them. George Washington’s older brother fought at the siege of Cartagena in 1741, and came back to name the family estate after the British admiral who commanded there, Edward Vernon, after all. The contradictory impulses of idealism and realpolitik in American foreign policy have their roots in colonial times, and neither the American public, nor American statesmen, thought that their strategic horizon was limited to the coasts in the eighteenth and nineteenth century, which is why no sooner had President Madison concluded the War of 1812 that he launched a second (and very successful) war in the Mediterranean against the Barbary states. Few scholars can match Betts’ relentless clarity and sober good sense when those are on display. But American Force, despite its particular excellences, reflects the limitations of approaches to strategy that look for rules of thumb, easy categorizations of politicians (particularly those with whom one disagrees), and foreshortened perspectives. Perhaps more profoundly, it suggests the importance of separating polemic from analysis, policy prescription from the attempt to understand why political men and women believe and do the things they do, in strategy as in everything else. Richard Betts is one of the most thoughtful scholars in the strategic studies guild. American Force is his latest book, a collection of essays, most of which were previously published in some form or another. The book is a strong contribution to the field and bears reading and re-reading, even, or perhaps especially, when one is not convinced by a particular claim (as I found to be the case for me at times). The theme of the book is understanding the limits on the efficacious use of military force in the pursuit of American interests. Betts is no pacifist. He allows that military force does have its uses. But he is squarely within the skeptics’ camp that believes that American policymakers resort to force too readily and without the requisite appreciation for its limits. After decades of reports on the challenges the U.S. military has faced in the Balkans, Africa, Central Asia, and the Middle East, this perspective is probably the conventional wisdom, especially in the strategic studies community. Yet Betts presents it with brio and often with deep insight. The first strand is persuasive because Betts describes both sides of a debate so compellingly that it is not quite clear which side he himself believes (and the reader has the sneaking suspicion he believes both). The second strand plays to the choir of angry critics, but otherwise does not persuade. There is enough of the first strand to make this book the best articulation of this particular ideology. There is enough of the second strand to make it at times a missed opportunity. I read with particular interest one of the new chapters, Chapter 2, which is a useful history lesson and a strong corrective to the myth that there have been wild swings in American grand strategy. Betts shows that the multilateralism of the Cold War looks a lot like the so-called unilateralism of the post-Cold War era, or, using a finer-grained lens, that the approaches of the Clinton era look a lot like the approaches of the Bush era. The publishing date cut-off probably prevented him from extending the analysis to the Obama era (and this may also explain why Betts appears to excuse Obama for conducting what appear to be the same Clinton and Bush sins that earned his wrath). On substantive terms, Betts does not adequately explain the appeal of the post-Cold War grand strategy because he fails to appreciate an important imperative that has motivated American grand strategy for at least a century: the desire to avoid waging the previous war. The preeminent goal of U.S. grand strategy since the end of World War I has been to confront global challenges without fighting whatever happened to be the last war. The reasons were self-evident to contemporaries – the last war, whichever one it was, and even if it was successful, was widely deemed to be unacceptably costly. Thus, Woodrow Wilson’s grand strategy of collective security was aimed at avoiding another World War I; Franklin D. Roosevelt’s strategy of helping sooner rather than later was aimed at avoiding the error of pre-World War I neutrality; Harry Truman and Dwight Eisenhower strove mightily to confront the Soviet menace without resorting to another conflagration like World War II. And the urgent imperative in the post-Cold War era was to prevent the emergence of a hostile peer rival who would challenge the United States across the full spectrum of issues and hold at risk American interests and values as the Soviet Union had done. Policymakers may have (probably?) exaggerated the likelihood of such reoccurrences, but they nevertheless worked strenuously and sincerely to avoid them. What Betts criticizes as expansionary was viewed by the strategists as more like defensive consolidation – firming up the existing world order so as to preserve it and extend its duration. Moreover, Betts unduly slights the (admittedly less-than-Soviet-equivalent) threats that consumed the attention of post-Cold War strategists: the spread of ethnic conflict, especially in Europe, and the spread of weapons of mass destruction. These threats were not totally new, although they took on new dimensions with the end of the Cold War. Thus, ethnic conflict, which was a staple of Africa and the sub-continent, migrated to the capitals of Europe. Concerns about the proliferation of WMD were legitimately heightened by the centrifugal forces that might spread the Soviet arsenal and, at a minimum, Soviet know-how, throughout the globe. Betts comes close to making the scurrilous charge that the U.S. approach to military force was the clichéd three-year-old with a hammer. The reality is that policymakers were justified in seeing many hangnails that could wound the United States and considering using a hammer to neutralize them. Betts also commits the same error of all the other critics of American militarism – a grand strategy equivalent of selecting on the dependent variable – by only examining closely actual uses of force. Of course, the policymaker vividly experiences a different reality, one where there are daily demands and opportunities for the use of force, the vast majority of which the policymaker rejects. One could follow this method page-by-page through this book and the result would be the same: a super-abundance of evidence that Betts is one of the most insightful strategists practicing today, alongside evidence that some passages would benefit from a bit more of the man who produced the first strand taking to task the man who produced the second. Yet both strands have important things to say and I have benefited from each. Richard Betts writes on national security policy with deep knowledge, candor, a healthy skepticism toward received wisdom—and a sometimes acerbic style. At a time when too much of the policy and academic literature is marked by predictable tropes, Betts’s works are always worth reading. Those who take the time to peruse this volume of his essays are likely to find topics on which they disagree, sometimes strongly, but they will benefit from having their preconceptions challenged by an original and rigorous thinker. Betts sets out his views on national security strategy while explaining how these have evolved with the passage of time and the transition from the Cold War to the post-Cold War environment. He is candid in describing his now strong skepticism about the use of military force, noting that, “It comes from someone with a history of arguing for strong military forces and energetic competition for influence in regional military equations throughout the world.” He describes his current thinking as that of a “Cold War hawk and post-Cold War dove” (xi). In his critique of post-Cold War military activism Betts challenges assumptions common to liberal internationalists as well as those who favor the ambitious use of American power to maintain primacy. Among the misconceptions he condemns are “liberal universalism and the habit of empire.” These entail a crusading liberalism along with the assumption common to the foreign policy establishment and majorities of both political parties that “deep inside every foreigner of good will must be an American struggling to get out” (9). Betts also targets notions such as “War as policing” and “Control on the cheap and primacy with purity” (10-11). Betts’ critique of post-Cold War military interventions (Chapter Three) is central to his overall argument. The Iraq and Afghanistan interventions are important cases in point, but as part of a broader critique. Military interventions should be very selective, undertaken only when strong national interest dictates, and then carried out decisively. He warns against the myth of impartiality and with Bosnia in mind, is scathingly critical of “compromises that kill” (54). As a guide to weighing future interventions, Betts sets out five points to be kept in mind: to make peace is to decide who rules; avoid half-measures; don’t confuse peace with justice; don’t confuse balance with peace or justice; and make humanitarian intervention militarily rational (62-64). Here and in subsequent chapters Betts critiques the often inconsistent logic and flawed implementation of U.S. post-Cold War military interventions. As he asks, “Why Haiti, Bosnia, Kosovo, and Libya, but not Rwanda, Sudan, Congo, Syria, or other places where suffering was more acute” (285). And for good measure, he writes that “there was no logical necessity for the U.S. to weigh in on the Balkans in the 1990s. . . ” (295). While Betts is not shy about setting out guidelines, he is too knowledgeable as a foreign policy thinker to suggest that these by themselves can suffice. Throughout the work, he ultimately qualifies and necessarily complicates his advice. For example, he offers strong cautions about preemption, yet on the topic of how to deal with the peril of Iranian nuclear proliferation, he sensibly cautions that “[t]his is simply one of the tragic problems in international politics for which there is no good answer” (141). Betts writes that force should be reserved for cases where “the anticipated benefit, moral or material, is high,” (285), but concedes that the answers are often unknowable in advance. He offers the “hedged” conclusion that, “there will be no formula to relieve American leaders of the need for judgment” (299). Betts’ arguments in favor of prudence, a realistic understanding about what the use of force involves, and the importance of careful judgment will commend themselves to many readers. However, some of Betts’ other recommendations may be more problematic. His argument for “massive force or none at all,” though qualified as a guideline but not a rule, seems too limiting (298). In the current case of Syria, Betts would presumably counsel non-intervention, yet not only are the stakes there almost certainly higher in “moral and material” terms than his approach would imply, but the options for U.S. policy are far more wide-ranging than all-or-nothing. Moreover, in assessing threats to the United States, it can be argued that Betts overemphasizes American rhetoric and policy as a fundamental cause of antagonisms. His approach implies that U.S. primacy and global engagement are key to the motivation of adversaries, and thus retrenchment and disengagement can alter the preferences and policies of others. To be sure, American policy does matter, but over-emphasis on this interactionist explanation risks depriving other actors of agency. The leaders of Iran, China, Russia, Venezuela, and North Korea possess their own entrenched motivations and world views which rest on much more than a response to American policy. As for al-Qaeda and other radical Islamist groups, their beliefs have deep roots that include ideology, religion, and history. A strong component of their motivation stems from individual and societal rage against the political, economic, and social failures of many Arab Muslim states. Illustratively, the late Osama bin-Laden, in a video widely distributed in the month after the 9/11 attacks, cited eighty years of Muslim “humiliation” and “degradation” at the hands of the West. This was a reference to the collapse of the Ottoman Empire and with it the Islamic Caliphate in the years after World War I – a time when the U.S. was absent altogether from the Middle East. To be sure, there is an ongoing, intense debate about whether radical jihadist terrorism is motivated by “occupation” or by ideology and belief. Nonetheless, Betts’ argument (as well as those of other mostly realist authors whom he cites) for withdrawal from the region and substantial or even radical departures in U.S. policy is unconvincing in its feasibility and its implication that this will significantly downgrade the kinds of threats (e.g., proliferation, terrorism) he acknowledges elsewhere. In his concluding pages, Betts writes that, “The United States needs to stand down from the condition of permanent war that has characterized the twenty-first century so far. . . ” (296). Some readers will agree, others may find the characterization of American policy hyperbolic, but almost all will find this book the most thoughtful, rigorous, and nuanced of the recent arguments for retrenchment in America’s military commitments and the use of force. This is a book driven by frustration: frustration with Americans who believe the world is much more dangerous than it actually is; with a post-Cold War bipartisan consensus that feeds an impulse toward military activism; with the American propensity to confuse operational military brilliance with actual strategic success; with an American agenda that pursues a degree of global order grossly beyond the nation’s capabilities; with a ballooning defense budget that has lost any true relationship with the actual threats America faces; with America’s tendency to believe that when it comes to actually using force, ambitious objectives can be achieved with little cost; with America’s inability to learn important lessons about the limits of military power beyond the short-lived shocks that come with the occasional bloody nose. Betts is certainly right when he admits that much of the book is “grumpy and negative,” but he has nothing to apologize for (xii). He puts his displeasure to excellent use, and for that American Force deserves to be widely read and debated. As Betts notes in his introduction, these frustrations are “hardly novel” among students of international relations. (6) The past twenty years (particularly the past ten years) have made countless commentators grumpy about the outsized role of military power in American foreign policy. The stream of books critical of American military activism that have appeared over the past two decades attests to the fact that Betts is not alone in his frustrations. Moreover, the impressive scope of issues that American Force addresses – ranging from humanitarian intervention, counter-terrorism, nuclear proliferation, preventive war, counterinsurgency, China and Russia, to budgeting and civil-military relations – does not necessarily distinguish its contributions. So what does it add to the existing literature that pushes a similarly critical perspective? politicians often conflate strategy with policy objectives (focusing on what the desired outcome should be, simply assuming that force will automatically move the adversary toward it), while many soldiers conflate strategy with operations (focusing on how to destroy targets or defeat enemies tactically, assuming that positive military effects automatically serve policy). The connection is never automatic (234). Betts perhaps understates the degree to which serious practitioners and outside observers do indeed wrestle with strategic complexities before plunging into ambitious military operations. But he does his readers a great service by hammering away with this warning about the traps created by haphazard expectations that brute operational prowess will yield the desired political end states that force is meant to serve. In what is arguably the most important chapter in the entire book (chapter 10, “Plans and Results: Is Strategy an Illusion?”), Betts dissects the many reasons why achieving sophisticated political ends through the blunt instrument of military force is so difficult. Even though it appears near the very end of the book, this outstanding discussion of strategy should really serve as a framing chapter for most of the preceding chapters examining the problems of intervention, terrorism, nuclear proliferation, preventive war and counterinsurgency. It goes a long way toward explaining Betts’ underlying perspective, his broader frustrations, his critiques of key cases. I think it would actually serve readers well if, after reading the introduction, they skipped ahead to chapter 10 before returning to chapter 2. Perhaps one of the most interesting discussions that might follow from Betts’ emphasis on the inherent difficulties of strategic action will be a debate over what to do with this point. It is conceivable that many readers will react by concluding that American political and military leaders simply need “better strategy,” so the United States is better able to achieve its political ends through the means available. Betts’ advice, however, cuts in the other direction: America must temper its policy ambitions. Instead of searching in vain for a better bridge between means and ends, he argues, American leaders must be willing to change the ends they seek, after recognizing the limitations imposed by the means available and the costs the nation is willing to pay. Unfortunately, there is no clear formula for determining at what point the wise strategist should move in this direction. Betts would likely advise leaders to establish modest goals from the outset; it is very tricky to change policy goals mid-stream, given the international and domestic political costs that would come along with what could be seen as a defeat. For example, America’s stated political objective for Iran and its nuclear program is to keep it from developing nuclear weapons. Betts’ chapter on the folly of preventive war provides outstanding reasons to reject military attack as the means to achieve this end – not because it will come at a high cost, but because preventive attack is unlikely to actually achieve the goal. Following Betts’ sound analysis, should the United States change its political ends now and fall back on deterrence as the means to hold the Iranian nuclear threat in check? Should the United States press on toward its original political ends, pursued through economic sanctions and sabotage, and only change its political goals if it becomes clear that these other means have failed to derail Iran’s assumed nuclear ambitions? Or, should the United States hold firm to its original policy ends and roll the dice with military force, despite the tenuous strategic bridge in this case between means and ends? Betts might argue that American strategists should alter these political ends sooner rather than later, particularly before suffering yet one more bloody nose. This is clearly not the consensus position in the United States on the Iran question. But even if Betts’ advice on Iran is rejected, his broader discussion of strategic complexity can serve as the basis for a more honest and thorough discussion about how to at least think about the problem, in this case and many others. And for this reason, American Force deserves wide attention. When I saw the names of three of the four reviewers, three eloquent spokesmen for the activist American primacy that the book criticizes, I braced myself. Bob Lieber and Peter Feaver, however, are gentler on me than I had a right to expect. Eliot Cohen is apparently as irked as I anticipated but does not focus as much as I expected on the overarching matter in dispute: whether the American habit of empire is wise or not. Of all four reviewers, Scott Silverstone seems to understand my book most perfectly. His exposition of reasons to read it is gratifyingly lucid. I could not have asked for a better review. Since I approve his judgment and interpretations, I have no more to say about his review except “thanks.” For readers of this symposium who remain unmoved to look at the book itself, Bob Lieber too surveys a good selection of my arguments, and his and Silverstone’s reviews together are the best summary of what I argue. I thank Eliot Cohen for his several kind words but am unsurprised that he finds the least value in the book, since he has been among the most prominent neoconservative promoters of the righteously muscular behavior that it targets. If my rough tone or combination of academic analysis with policy opinion is objectionable, as he suggests, I have no defense, and only hope that readers will engage my book anyway. The one criticism that bothers me is Cohen’s charge that I lack empathy for the difficulty and complexity with which high-level policymakers must grapple. On this I am grateful to Peter Feaver’s review for quoting one of the several passages in which I go to some lengths to admit how just such challenges distinguish the burden of responsibility from the luxury of criticism. (In one of the other such passages I also wrote, “I have no confidence that I would always have done better” [xii].) Despite such disclaimers I should feel chastened by Eliot’s charge if I did not suspect a double standard here. Perhaps my recollection of his own commentaries over the years in The Wall Street Journal and elsewhere on the performance of Jimmy Carter, Bill Clinton, or Barack Obama is mistaken, but I do not have the impression that he has been less acerbic or more understanding about them than he implies I should be about the second George Bush. Indeed, in the past Cohen has argued the need for leaders to be held more ruthlessly accountable for failures to cope with disasters that unfold under them. He is reported to have argued this directly to President Bush in regard to General George W. Casey’s command in Iraq. Doubtless everything looked more complicated and fraught to Casey, laboring on the spot, but that does not mean Cohen was wrong to give him a failing grade. Any failure of Casey’s, however, is secondary to the greater one of launching that war in the first place. If Bush and company had really done justice to the point Cohen makes—if they had more carefully confronted the complexity and ambiguity that he says “inhabitants of the Oval Office understand very well,” instead of proceeding on the basis of gut instinct, hubris, and the counsel of like-minded ideologues—they might have avoided the tragedy that provoked my alleged insensitivity. This is all simply to suggest why Cohen mistakes my lack of sympathy for lack of empathy. On Osirak, I did not argue that the Israeli attack “had no serious impact on the Iraqi program;” rather I made the unconventional argument that it probably accelerated it (137). Recently published research by Malfrid Braut-Hegghammer, based on previously secret Iraqi sources, supports this judgment. As on earlier disputes about problems of strategic intelligence, Cohen and I seem fated to quarrel with each other’s interpretations of our writings. I regret that he feels I caricatured his book, but his rebuttal seems to miss the points I was making. I am also not quite as ignorant as Cohen suggests. Of course history did not begin in 1945, and the United States has always been involved abroad militarily. My point was about the extremes to which we have drifted, to thinking of national security as somehow different from homeland security, seeing control of all world order as a military task, and organizing our government and military system more in those terms than even the forthrightly imperial powers of the past (9-10). Bob Lieber has argued in the past for more American activism than I like, so I thank him for the generous tone of his review here. Among his few criticisms he suggests that I exaggerate the extent to which the United States creates antagonism, and that adversaries are not just reacting to American initiatives but have a variety of independent agendas and motives. I agree and did not mean to imply otherwise. In one real disagreement Lieber criticizes my recommendation for choosing either decisive force or none at all as “too limiting,” although he recognizes that I note that there will be exceptions to the guideline. He illustrates his criticism by saying that in regard to Syria today “the options for U.S. policy are more wide-ranging than all or nothing,” but this is not really a disagreement. My chapter 3, “Confused Interventions,” argues clearly that limited force is wrong if it is indecisive and promotes stalemate, but not if it tilts the balance and enables the preferred side to win—as in Libya last year. Cohen’s suggestion that my argument against half-measures implies the solution in Libya was “carpet bombing” similarly misses that point. All of my critics should also remember that the main arguments in the book are about overt use of conventional military force, and that I explicitly endorse the utility of covert action or special operations in some cases, such as Iran today, where I oppose initiating regular military attack (141, 276, 286). Peter Feaver believes I distort the record by exaggerating the U.S. tendency to resort to force reflexively and ignoring the many cases of restraint. I did write, however, that “most crises are resolved by diplomacy rather than combat” (53), that there are cases such as Rwanda in 1994 where force should have been applied but was withheld (14, 62, 65, 269), and that “some of the American uses of force in recent years were necessary, proper, and effective” (4). My argument is simply that the number and severity of mistaken military actions since the Cold War outweigh those points. Feaver is quite right to note that the policymakers I criticize thought their actions were “defensive consolidation” rather than “expansionary.” The “existing world order” they were trying to consolidate, however, was unipolarity and American control. Offensive strategies like the preventive war against Iraq are usually motivated by what their promoters believe are defensive aims. Benign motives do not excuse excessive ambition, or igniting war in the name of preventing it. Eliot A. Cohen, Supreme Command: Soldiers, Statesmen, and Leadership in Wartime” (New York: Free Press, 2002). Betts writes that I have written a book about civilian war leaders whose “military judgment appeared better than that of the military,” which is not what the book is about (207). The book is, rather, about the complexities of civil-military relations at the top, and the nature of the dialogue and the decisions conducted by senior political leaders with their military subordinates. It notes, for example, that Winston Churchill had some wildly improvident notions about operations: the key point is that he could get talked out of them by his military subordinates (see Supreme Command, pp. 112-114). Similarly, when Betts criticizes Supreme Command for focusing exclusively on exceptional civilian statesmen (228), he disregards the explanation I give in the introduction to the book for having done so, as well as an entire chapter entitled “Leadership Without Genius,” (Supreme Command, pp. 173-207) which discusses the problem of mediocre political leadership. A quote from Supreme Command: “Lincoln, Clemenceau, Churchill, and Ben-Gurion each made his share of mistakes. Each, on occasion, misjudged his opponents, indulged incompetents or penalized the merely unlucky, ignored unpleasant realities and feared chimeras. Each adhered to flawed strategic views, meddled, or judged too harshly. Had their generals simply saluted and acceded meekly to their opinions, disaster would have resulted.” (Supreme Command, p. 173). Betts’ chapter on civil-military relations is taken up primarily with a rigid defense of the work of a mentor we shared, Samuel P. Huntington. But Huntington’s books are now more than half a century old, were based on problematic historical scholarship, and though brilliant, deserve something other than unyielding defense. A critical re-evaluation of them is, I believe, more in the spirit of Huntington the scholar and teacher than an implacable insistence that they are the final word on the subject. See, for example, Christopher Layne, The Peace of Illusions: American Grand Strategy from 1940 to the Present, (Ithaca, New York: Cornell University Press, 2006); Andrew Bacevich, The New American Militarism: How Americans are Seduced by War (Oxford: Oxford University Press, 2005); and John Mearsheimer, “Imperial by Design,” The National Interest, Jan-Feb 2011. John Gerard Ruggie, Winning the Peace: America and World Order in the New Era (New York: Columbia University Press, 1996). See also Betts’ definitive critique of Ikenberry’s Liberal Leviathan in “Institutional Imperialism,” The National Interest, No. 131 (May/June 2011): 85-96. Text of bin Laden Remarks, “Hypocrisy Rears Its Ugly Head,” as broadcast by Al-Jazeera television on October 7, 2001, Washington Post, October 8, 2001. See especially, Assaf Moghadam, “Suicide Terrorism, Occupation, and the Globalization of Martyrdom: A Critique of Dying to Win,” Studies in Conflict and Terrorism, Volume 29, Number 8 (December 2006). President William J. Clinton, Remarks to the 48th Session of the United Nations General Assembly (27 September 1993). Available at http://www.presidency.ucsb.edu/ws/index.php?pid=47119, accessed on 4 November 2012. Secretary of Defense Robert M. Gates, address at the United States Military Academy at West Point, 25 February 2011. Available at http://www.defense.gov/speeches/speech.aspx?speechid=1539, accessed on 4 November 2012. Thomas E. Ricks, The Gamble: General David Petraeus and the American Military Adventure in Iraq, 2006-2008 (New York: Penguin Press, 2009), 14, 43, 98-99. At risk of beating the point into the ground, my argument was that Clinton and Bush acted similarly in practice despite differences in principle. If Cohen really means to claim that Bush was actually more multilateral than Clinton, however, I must soften my argument in order to correct his version of history: on Bosnia (and Kosovo four years later) Clinton had NATO on board for combat but not the UN; on Iraq in 2003, Bush had neither. Malfrid Braut-Hegghammer, “Revisiting Osirak: Preventive Attacks and Nuclear Proliferation Risks,” International Security 36, no. 1 (Summer 2011). I did not write or mean to imply that Cohen fails to recognize that civilian leaders often make mistakes. If the four cases he chose to highlight in separate chapters were not shown primarily as examples of generally good civilian challenges to military judgment, however, I plead guilty to misreading. I simply said that his four choices were not necessarily a representative sample of intrusive civilian managers and left open the question of what a systematic study would show about the record of civilians and military getting into each other’s business—whether civilian leaders are more often right in their judgments about operational matters than military leaders are about strategy (228-229). Regarding my defense of Samuel Huntington’s argument against “subjective” civilian control of the military, I do not know why Cohen considers it “rigid” and “implacable.” I conceded that certain crucial issues Huntington did not engage gave grounds for more “fusion” of functions than he wanted and that politicization should not be as absolutely purged as the pure model of objective control (which was after all a model, not a blanket prescription) recommended (227, 230). In any case, Cohen’s footnote here does not address the main criticism of subjective control—that it will politicize civil-military relations excessively, contaminating military professionalism with partisanship. His book did not focus on that issue but Huntington’s did.